Sports parents have a big impact on their young superstars. A healthy and successful sports experience will depend on sports parents’ ability to instill confidence and self-esteem in athletes. Read sports psychology expert, Dr. Patrick Cohn’s view on how to make sports a successful and fun experience. Youth sports are huge in today’s society. Coaches and parents have a tremendous impact on how children will engage in sports. I get several emails a month from concerned sports parents asking me how they should help their child superstar win at and enjoy sports. When working with young athletes, I often work with the parents themselves so parents can reinforce the concepts I teach to athletes in our mental game coaching sessions. Below are eight simple guidelines for sports parents to adopt with youth athletes. 1. Sports should be fun for kids. Treat sport as a game—It’s not a business for kids. With all the money in professional sports today, it is hard for parents to understand that it’s just good fun to young athletes. The primary goal should be to have fun and enjoy the healthy competition. 2. Your own agenda is not your child’s. Young athletes compete in sports for many reasons. They enjoy the competition, like the social aspect, engage with being part of a team, and enjoy the challenge of setting goals. You might have a different agenda than your child and you need to recognize that racing is your child’s sport, not yours. 3. Emphasize a mental focus on the process of execution instead of results or trophies. We live in a society that focuses on results and winning, but winning come from working the process and enjoying the ride. 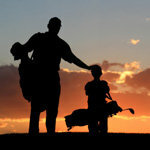 Teach your child to focus on the process of the challenge of playing one shot, stroke, or race at a time instead of the number of wins or trophies. 4. You are a role model for your child athlete. As such, you should model composure and poise on the sidelines. When you are at competition, your child mimics your behavior as well as other role models. You become a role model in how you react to a close race or the questionable behavior of a competitor. Stay calm, composed, and in control during games so your child superstar can mimic those positive behaviors. 5. Refrain from game-time coaching. During competition, it’s time to just let them play. All the practice should be set aside because this is the time that athletes need trust in the training and react on the court or field. “Just do it” as the saying goes. Too much coaching (or over-coaching) can lead to mistakes and cautious performance (called paralysis by over analysis in my work). Save the coaching for practice and use encouragement at game time instead. 6. Help you athlete to detach self-esteem from achievement. Too many athletes I work with attach self-worth to the level of performance or outcomes. Help your child understand that they are a person FIRST who happens to be an athlete instead of an athlete who happens to be a person. Success or number of wins should not determine a person’s self-esteem. 7. Ask your child athlete the right questions. Asking the right questions after competition and games will tell your child what you think is important in sports. If you ask, “Did you win?” your child will think winning is important. If you ask, “Did you have fun?” he or she will assume having fun is important. 8. Pledge the: P.A.Y.S. Parent’s Code of Ethics. PAYS (Parents Association for Youth Sports) provides a parental handbook and code of ethics that adults must sign before each competitive season. This is a great tool to guide parents in their interaction with young athletes. 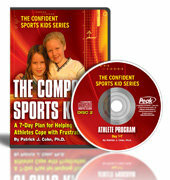 Dr. Patrick Cohn and Lisa Cohn are founders of The Ultimate Sports Parent. Listen to their radio show and download their free e-book, “Ten Tips to Improve Confidence and Success in Young Athletes,” by visiting The Ultimate Sports Parent.